So, you’ve been invited to a friend’s boat and you’re going to stay there for a few days. Sweet! Congratulations. You’re going to have a blast. If you’ve been camping, have gone hiking, or have a general interest in outdoors fun then you’ve most likely got the things you need for being on a boat, which really isn’t much. Your best pieces of “equipment” are really your attitude, sense of adventure, and openness to the fact that plans may, and most likely will, change. 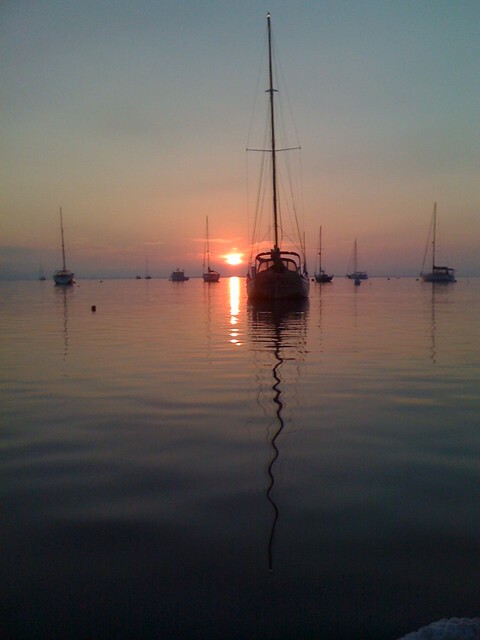 Speaking of changing plans, I talked with a very seasoned liveaboard sailor the other day who said the mostly simply stated truth of a short stay on a sailboat: A guest can pick places they’d like to go or how much time they’d like to spend on the sailboat, but not both. Makes sense, right? You can pick one of the two, because the wind is our propulsion and is not under our control. If you have definite arrival and departure dates, then that’s fine, you do what you can in that time. If you’d like to go from one part of Maine, let’s say, to another, then there’s no way to tell if you you could do that in a certain timeframe, because you can’t predict that timeframe. Get it? This blog post is all about what you’ll need for your visit, what you can expect when aboard, and other practical boat etiquette that will make your stay a breeze. Boats have limited space in them. Avoid packing your gear in hard containers like suitcases or big backpacking rigs. The best thing to pack in is a duffel bag or somesuch totally structureless bag that can be stuffed away while you’re aboard. variety among your clothing, things you can layer, hopefully some things that are synthetic or wool (easy to dry) materials: long sleeve shirt, shorts, pants, short sleeved shirts, etc. Don’t pack outfits, rather, pack things that could keep you comfortable in lots of situations if combined in various ways. limit the amount of electronics you bring. mp3 players, cameras and phones are great, but be sure to store them in watertight bags for going between the boat and land. Zip sandwich bags can suffice, or if you happen to have a dry bag that’s the perfect thing. Unless you need it, avoid bringing a computer. feel free to bring a book if you like. water container like Nalgene, though we have some on board too and can spot you one. various books, magazines, games, etc. pantry items like rice, spices, oil, etc. Most boat folk don’t have the dough to pay for time at slips or docks. They moor or anchor, which means to get to the boat from land, you’ll go by a smaller boat called a dinghy. We here on Mimi Rose are definitely the anchoring types. This is why it’s great to travel light, beside the fact there isn’t much room to stow your personal effects on the boat. Carrying a lot of gear via dinghy is tough. We generate our own electricity and everything on board is 12V. We sparingly use it and can teach you how to use this and that around the boat. Maybe we can charge your electronics, but it really depends. Best to come aboard with a freshly charged battery on that camera or MP3 player. Aboard the boat we enjoy simple living. We eat in a lot (and we eat VERY well). We carry our trash/compost/recycling ashore. There is no private bathroom or shower on board. We tend to get up early and go to bed early. It’s just like camping, where all that fresh air and sun just wears you out like Gaia intended. Fun fact: Salt water, when it soaks something, can make that thing very hard to dry. Salt attracts moisture. This means your towel might, over a few days of swimming, get to the point where it stubbornly won’t dry. Just a fun fact for you. Don’t bring two towels or anything. The boat, when sailing or even when at anchor, moves. When underway, depending on the wind, the boat heels– that’s a boat term that means the boat leans sideways at about a 45 degree angle to the water. Wow, right? It’s fun and awesome. It’s also disconcerting for some people. You’re safe. There’s more lead in this keel than you can shake a stick at. It acts as a counterweight. The motion of the boat also means that before we get underway we stow everything in preparation for however which way the boat might move. Mindfulness of this fact by all on board make for uneventful, and ultimately fun, days of sailing. Want to learn what we’re doing and pull on some lines yourself? YES YOU CAN. The terms are easy to learn, the helm is easy to handle, and you’re more than welcome to get involved with the workings of the boat. Some boat people imply that sailing has its own “language.” Well then so do science and baseball and automobiles and art… these, too, all have words you didn’t know before, and as you’re around those things, the words come. The boat is a big piece of beautiful sports equipment that brings you in harmony with nature, that takes you to islands you can’t drive to, and has the magical ability to slow time down. It’s our home and we’re so glad you’re coming. This entry was posted in Uncategorized on August 8, 2012 by Anne. You probably won’t see any sharks (although a friendly dolphin may splash by) where you are swimming. But you might run into some jellyfish or Portuguese man-of-wars. These umbrella-shaped, nearly clear animals can grow to be as large as several feet in diameter! They are often found floating near the shore. Getting stung is no fun — it can hurt and blister your skin. If you get stung, tell an adult as soon as possible.